THIS IS A MAN . . .
Mark Rippee – Mug shot taken for falling asleep on the sidewalk. One out of the more than 100 times he has been arrested in the last year alone. Photo Courtesy Catherine Rippee-Hanson. You know about Mark Rippee if you live around Vacaville, CA. Or if you read the text of the talk I delivered at the Pathways to Hope conference in San Antonio on August 24. Mark Rippee has survived on the streets of Vacaville for nearly twelve years despite being sightless, missing parts of his brain, enduring the pain of an interior metal rod to support his shattered right leg, fifty surgeries—many of them to heal the wounds he has suffered from repeated beatings by passing thugs. . .
. . . And, oh yes: despite his diagnosis of acute schizophrenia (a diagnosis that, weirdly, Mark’s family cannot definitively confirm because of restrictive and nearly useless laws). As hundreds of millions of dollars in new-housing money languish in law-court entanglements, the death toll among California’s homeless has been rising: infections, pneumonia, cancer, cirrhosis, and other treatable diseases claim ever-more victims. In 2017, eight hundred thirty-one street people died in 2017, nearly doubling the count of 458 in 2013. 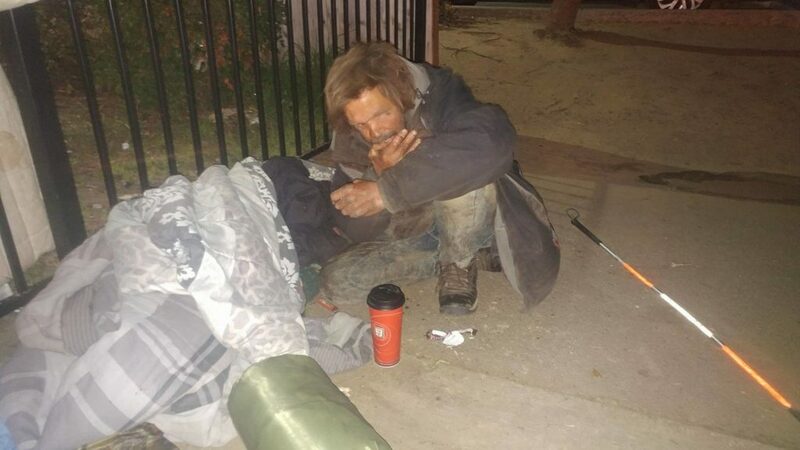 A Los Angeles County study reported by Politifact reported that more than one-fourth of the homeless are seriously mentally ill. Other estimates place the figure at one third. The homeless mentally ill (in California and elsewhere) exist under twin, paradoxical curses: they are public eyesores. Pedestrians grimace as they step over their inert forms or cross the street to avoid their wild gestures and ranting. At the same time, they are invisible: faceless statistics, generic, interchangeable, somehow less than human because of their madness. Mark Rippee two years after his accident. He had calmed down and more lucid though doctors warned that it would not last. Photo Courtesy Catherine Rippee-Hanson. Mark Rippee is one of these living paradoxes. Perhaps he should be their national symbol. His nearly faceless face is the face of the faceless: the face of our gravely disabled brothers and sisters who live and suffer and howl and die, bereft of help from government, agencies, and many churches, on the streets of our cities. Force yourself to contemplate what is left of Mark Rippee’s face for as long as you can stand to hold his sightless gaze and think about the obscenity of your country’s mental healthcare system. 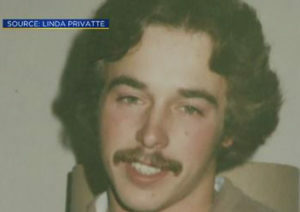 Thirty-one years ago, Mark Rippee was a handsome and hopeful young man. At age 23, he was a productive member of the Vacaville community, a robust construction worker with a girlfriend, still mapping his life-plans. Those plans blew to bits in an instant on the Sunday night of June 21, 1987—Fathers Day. On a dark country road, astride a Harley-Davidson motorcycle that he had owned for only a few days, Mark swerved to avoid an oncoming car that had drifted into his lane and tore through an alfalfa field until the bike ploughed at high speed into a grain harvester. The impact tore a deep T-shaped gash across Mark’s face, destroying his eyes and exposing his frontal lobe, grey bits of which were found around him. His right leg was ripped open from his crotch to his ankle and broken in several places The EMTs who loaded him into an ambulance assumed he was dead until they noticed movement en route to the hospital. Mark Rippee two years after his accident. He had calmed down and more lucid although doctors warned that it would not last. Photo Courtesy Catherine Rippee-Hanson. Mark Rippee survived his shattering injuries. His accident, however, struck hard at his close-knit family. 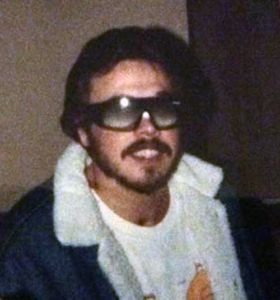 His father James suffered a breakdown soon afterward, entering a state of denial that led him to prohibit Mark’s twin sisters, Linda and Catherine, from securing Mark’s commitment in an institution. Six years later, James Rippee suffered a stroke and died. Mark’s mother, Lou, now 78, also commenced a long, slow decline in her health. For eighteen years Mark managed to live at the borders of a peaceful and secure life, given the givens. His mother and his twin sisters (both of whom married) threw themselves into his welfare with the aid of a part-time caregiver. At intervals, and with support, Mark could maintain his own apartments. The three women kept hope alive. They never lost their love for the invisible man beneath the disfigurement and the ravaged brain. That hope eroded with each of the twenty-odd operations on Mark’s brain to scoop out abscesses (Mark has undergone more than fifty operations in all). Each brain surgery eliminated more grey matter. Each elimination weakened Mark Rippee’s capacity to think clearly and increased his tendencies to erratic, threatening behavior. Mark hallucinated. He heard voices, spoke in the personas of three different people. Mark’s psychosis deepened. He barred his mother from his apartment, yelling that he would kill her if she came in—he did not believe it was his mother. The sisters feared he would hurt her. His mother stopped caring for him; after twenty years the stress on her was taking a toll. Shortly afterward Mark was evicted for starting a fire outside his apartment door. Mark Rippee clearly was now beyond the family’s control. A few years earlier, a psychiatrist had diagnosed the young man as afflicted with paranoid schizophrenia. But Mark’s delusions had by then swept him well beyond the capacity to assent to therapeutic treatment or medications. The sisters began to search for a therapeutic sanctuary and psychiatric care. In doing so they entered a labyrinthine world, a world that often mystifies most Americans, including relatives of the mentally ill: a world of bureaucracies piled upon bureaucracies: municipal and state government, psychiatric hospitals, police departments. A world of strange acronyms (CBT, CET, CMHC, AB, ADC, HHRMAC, SB, SHIP, SHOP—the list extends into the hundreds.) Behind the acronyms stretched a thicket of rules, restrictions, policies, protocols—all designed, it seemed, to pass the buck, evade accountability, and keep the mentally ill as far as possible from reclamatory help. The years pass, and the trail of the sisters’ efforts grows long, convoluted, chockablock with blind alleys, false leads, rebuffs, personal humiliation. Not even Linda or CJ can fully reconstruct its nightmare skein. Among the most infernal of the acronyms was HIPAA. HIPAA: the Health Insurance Portability and Accountability Act. Congress created HIPAA in 1996. Essentially, it is a misbegotten tool for ensuring the informational privacy of a patient in the health-care system. In practice, HIPAA has deprived countless thousands of family members from information vital to helping them understand what is wrong with their loved one, and what to do about it. Leading advocates for mental healthcare reform have insisted that HIPAA be either radically reconceived or scrapped. HIPAA rules prevented the Rippee family even from being able to confirm that diagnosis of Mark as a paranoid schizophrenic. (It was relayed to them by a mutual friend of the psychiatrist.) Nor could they ascertain his medication needs. The absurdity of this standard radiates from its description: how is it possible to prove that someone is a danger to self or others unless that person commits an act that is—well, one can see where one is going with this. Yet even committing such an act is no guarantee that the perpetrator will be taken under care. Consider the case of—oh, James Mark Rippee: the loaded gun. The stun gun. The threats of suicide. The threats on his mother’s life. The fire he set. The attempted jumps from moving cars and overpasses. Yet as I write these words, James Mark Rippee remains blindly, madly, on his own; a man, in effect, without a country. Certainly without a country that gives a damn whether he lives or dies, as long as he just stays the hell out of sight. “Gravely disabled” describes one of the several lurching measures to slap a tourniquet over the worst bleeding wounds of deinstitutionalization. 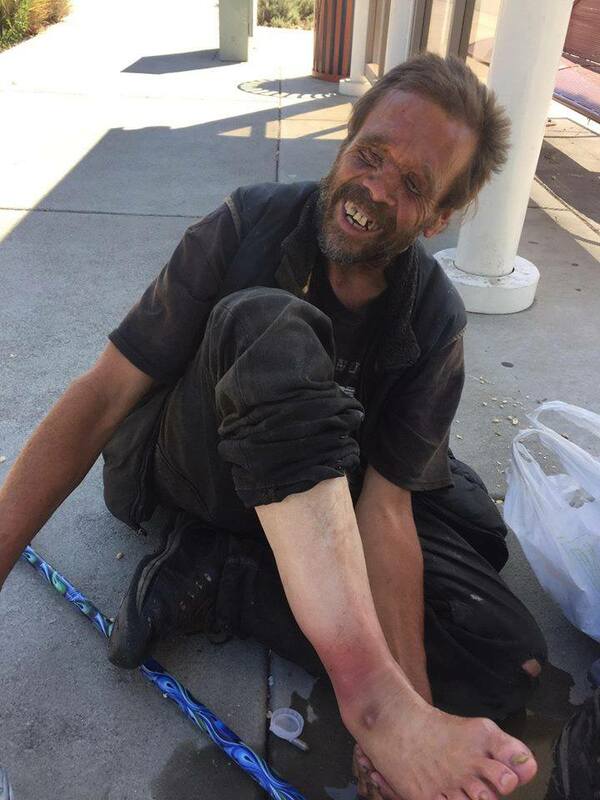 Encoded in two similar bills, AB 1971 and AB 2156, “gravely disabled” is the standard for which the state would intervene in an uncooperative homeless victim’s life and usher that person to shelter and treatment. A person is considered gravely disabled if he/she is unable to. provide for basic needs for food, clothing, or shelter because of a mental disorder of impairment such as alcoholism. That’s the theory, at least. Linda and Catherine—Linda, after her sister weakened from her cancer—showed up at meetings of the Solano County Board of Supervisors to encourage support passage of AB 1971. They spoke up. They wrote volumes of emails to the committee. For their troubles, they found that “gravely disabled,” like “danger to self in others,” resides largely in the eye of the beholder: the eye being that of the agency in charge of enforcing it. The sisters rejoiced when AB 1971 was passed by the California Assembly, even though it was stipulated only as a five-year pilot program, and only for Los Angeles County, not the entire state. With Catherine depleted by her disease and Lou Rippee awash in depression, Linda Privatte struggles on alone to reclaim what is left of her brother. You are entitled to look away from your brother, Linda (though you won’t, not for long). 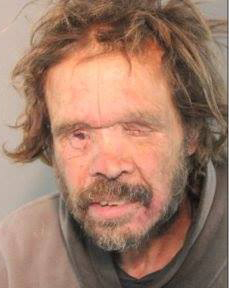 It is the rest of us who are morally obligated to keep looking into James Mark Rippee’s nearly faceless face, until we accept that this man and all his gravely disabled mentally broken brothers and sisters are our brothers and sisters as well, and that we must not look away until we have inspired or shamed our country into facing them and giving them sanctuary. For God’s sake, this is a man. He is not invisible. He is not expendable. With any humanity left in us, let us help him. This is a man. This is a man. This is my brother. Note: on Monday, September 10, I invited two members of the Solano County, CA, Board of Supervisors to respond to comments by CJ Hanson and Linda Privatte that addressed their comments and policy positions. At this writing neither has responded. I will post any comments from them should they come in. I invite and encourage repostings of this blog entry from other sites, from newspapers and magazines, and from other print and online journals. No further permission is required. Author noonecaresaboutcrazypeople_1y4oqpPosted on September 12, 2018 December 3, 2018 Categories mental healthcareTags brain injury, healthcare system, mark rippee, mental illness, motorcycle accident, ron powers, schizophrenia, tbiLeave a comment on THIS IS A MAN . . .